Working a trade show booth generating a lot of traffic/qualified leads and creating the company's awareness. Working a trade show generating a lot of traffic/qualified leads creating the company's awareness. Audience reaction; a picture speaks a thousand words! Back stage before my show for the world famous Harlem Globtrotters. Shark Tank star multi-millionaire Mr Wonderful Kevin O'Leary. 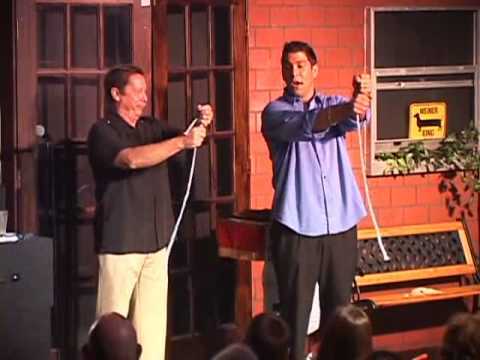 AWARD WINNING comedy magician Mitchell J. Davie has performed OVER 12,000 career shows. Mitchell has been seen live by more than two million people and has performed for the biggest named Hollywood celebrities and professional sports teams. He's had acting rolls in soap operas, short films and motion pictures. So no matter what your event; you can be sure that Mitchell will deliver a most unforgettable show sure to be remembered for years to come. 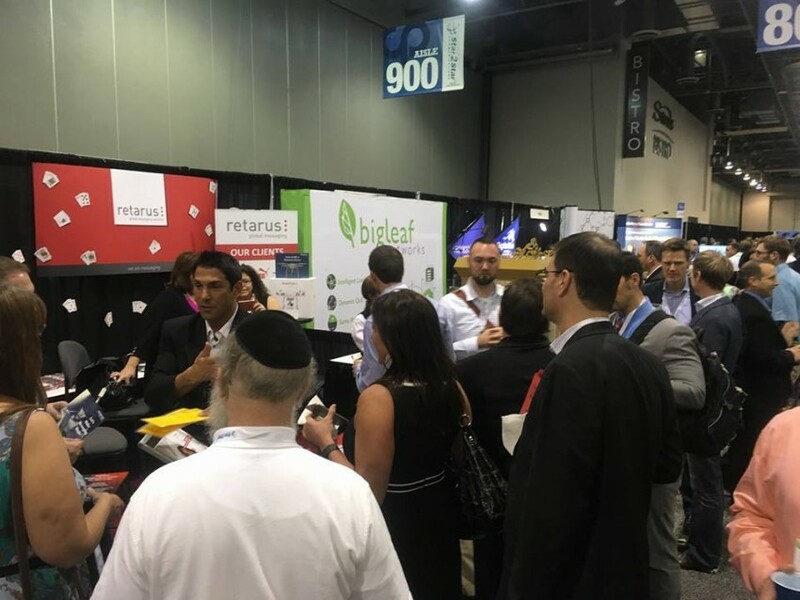 ALSO, if your company is having a TRADE SHOW and you would like to maximize your investment getting a nice ROI then look no further; generating booth traffic, getting you qualified leads and creating your company's awareness is what Mitchell does. He's more than just magic! We engaged Mitchell Davie for our 50th wedding anniversary aboard a sunset cruise in Fort Lauderdale and he more than lived up to our expectations. He is very, very entertaining and capable of holding any audience, from seven (our grandchildren) to seventy (our peers). He is funny and incredibly skilled. Treat yourself and your guests to a wonderful event with Mitchell. One of the BEST entertainers we've had!! I am ecstatic that I found Mitchell Davie for our banquet! We have had a lot of famous entertainers, and I'd have to say that he was by far my favorite! Mitchell is very dependable and is definetely a crowd pleaser! The audience laughed for his whole show, and I got many compliments afterwards for finding him. If I could give him 10 stars, I would!!!! If you're looking for an entertainer who is hilarious and who you can truly see that he cares about his crowd, then Mitchell Davie is the man for your event! 12-month-old babies all the way through 5 year olds. The teachers and parents were laughing so much and kept looking at me and asking where I found him! I've seen his work at birthday parties, I've seen his work online and my friend saw him as the entertainment on their cruise ship. I have never met or seen anyone like him! He truly is amazing and has everyone saying after every trick- "wow how did he do that?!" I like how he Includes the whole audience - no matter how large or small! He is professional, honest, reliable, funny and extremely talented!!! All the kids, teachers and parents loved him and one teacher even plans on hiring him for a cocktail party for adults. He is a jack of all trades when it comes to the places he can perform...I highly recommend him!! Another important thing is he called the day before and showed up exactly on time which is a great thing because when you are organizing so many things for a school you want to make sure that the one thing you do not have to worry about is the main prize not showing!!! We had an unexpected torrential downpour that really threw all of our plans out the window. We had no music because all the circuits had popped! Mitchell entertained all of our guests and truly went above and beyond to keep the party going. We got rave reviews from everyone that attended. I highly recommend booking him for your next event! FANTASTIC Entertainer for our Party! Mitch entertained and amazed our guests, as he strolled and mingled. His magic was terrific, as was his banter! Wherever he was, the crowd gathered around him was laughing and saying "Wow!" I asked SEVERAL of our guests what they thought of Mitch, and each person said that he was terrific, and thanked me for having him there. If you're considering hiring Mitch for a party, trade show or corporate event, or for a stage show, I HIGHLY recommend him! Mitch mixed humor, magic and human connection in one package. He thoroughly entertained everyone in my company event. Very good show. Thank you, Mitch. Mitch is awesome entertainer who engages the audience and keeps you laughing for the entire time. Would love to see him perform again soon! I am the Recreation Supervisor for the Sunrise Senior Center and we do many events for our Seniors. We kicked off our 2018-2019 season with a Halloween themed event on October 30th and decided to add a Comedy/Magic twist to it. That was by far the best decision we could have made, due to the totally amazing performance by Mitch Davie. He was truly entertaining and the Seniors and staff had a fabulous time. His energy, quick wit and off course the magic, made this a truly memorable performance. We would highly recommend Mitch for any event! UNBELIVABLE! MITCH IS A REAL PRO. HE WILL LEAVE YOU LAUGHING AND ASTONISHED. GREAT FOR KIDS PARTIES AND ADULT FUNCTIONS..
SCEPTICS WILL WALK AWAY SCRATCHING THEIR HEADS..
My husband celebrated his 75 birthday with family, friends at our home - a total of 58 people of all ages - youngest was 4. Mitch came on time and mingled through the party attracting small groups of delighted and amazed guests. What an asset it was for us to have him do his magic. 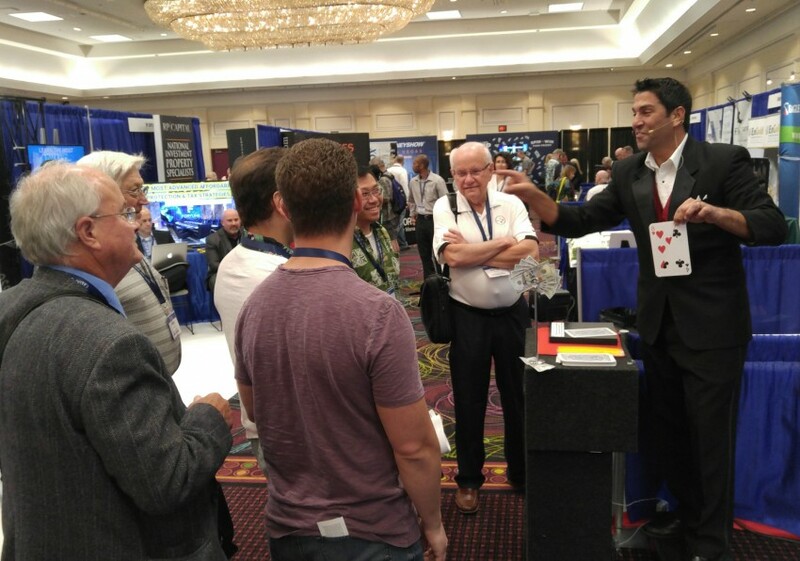 Mitchell performed his magic at 2 of our corporate events this past week, and he was engaging, his tricks mesmerizing, and guests were awed! We would definitely recommend Mitchell!! I hired Mitchell to perform at a corporate Chrismas party. The guests raved about him for days. I would absolutely recommend him. He is courteous, personable, responsible and the consummate professional. Mitch is very kind & gives a wonderful show! It was an honor to have had Mitch for my Holiday Party entertainment. He was able to give the adults as well as kids a great show! I was worried about how the kids at my event would be entertained, as I did not have anything further planned. However, they completely loved Mitch's show; I am so grateful! Don't think twice about booking him, he is the best around! Mitch not only kept the kids engaged the entire time all the adults ended up being a part of the show. The entire experience certainly exceeded my expectations. Mitch made the whole party! He made my son's 11th birthday party a complete success! Not only were the kids amazed but so were their parents. They all posted on my Facebook page that the party was fantastic and their kids really enjoyed themselves and that's all they could talk about. I've never received so much feedback from a birthday party before and I have 3 kids so that's 38 birthday parties. I highly recommend him to anyone of all ages looking to be entertained by a magician! Just A M A Z I N G! Mitchell kept more than 30 kids, ages between 3 - 10, plus adults turned on his show for 55minutes! That was awesome! He was very nice with my needs, asking question about guests ages and my expectations. He arrived early, so he had enough time to prepare himself for the show without a hurry or any concern. I really recommend his service for everyone! We hired Mitch for my daughter's 11th birthday. We had girls ages 6 to 12 + adults and everyone had a great time! Even the adults were laughing out loud. Very entertaining. Would definitely recommend! Mitch was so funny his show had us laughing the whole time. Great fun family entertainment. Hey Steve, thanks for the kind words and for looking me up on line. Lasts nights show was such a good time, what a great audience to perform for. I hope you enjoyed the rest of your evening on the cruise! Great show for kids and parents! Awesome show! The magician has a great personality and make the show interesting and fun to everyone. Definitively, we will recommend him to our friends. I searched long and hard to find the perfect magician for our company New Year's Eve party, I cannot say enough positive things about Mitchell from his talent to his professionalism to his overall deliverance of the perfect evening. I would highly recommend him to anyone. Mitch is an absolutely amazing Magician. He did a show for my daughter's birthday party and now every parent who was there wants to book him for their child's party. I have seen Mitch perform in a couple different settings, and his show is always different and conforms perfectly to the audience he is performing for. I highly recommend Mitch for any age group... he is simply amazing!! Mitch recently worked a trade show for us. He was engaging and attracted people to our booth. We were able to spend more one on one time with these attendees after they stopped to watch Mitch. This allowed us to have more meaningful conversations and qualify many more leads than we would have without him being in the booth. Personable, fun, and engaging! Had a youth group activity for pre K to 2nd grade, they all LOVED the show! All logistics and set up went very smooth, Mitch took care of everything and all I had to do is enjoy the show with the kids. Mitchell did strolling magic during the cocktail hour at my kids B'nai Mitzvah. He kept the kids engaged and entertained. The kids as well as the adults were amazed and fascinated. Not only is he talented, he is a very nice guy and very easy to work with. I will definitely hire him for all my events in the future. Mitch was the best ever! Original tricks and indescribable energy. My 5 year old and adults loved Mitch and talked about him the entire night. Don't hesitate..HIRE MITCH!! Mitch performed an almost 60-minute show for my daughter's 5th year birthday party. There were 60 kids aged 2-6. Mitch held the children's attention from beginning to end, all the parents were awed by how well he kept them engaged. The kids laughed at all his jokes and seemed delighted by everything he said. Mitch performed a very age appropriate show and made my daughter feel special by having her assist for a few tricks. Numerous parents asked me for his contact information after the party, remarking how great he was with kids. I would highly recommend him and will definitely be hiring him again in the future! Mitchell was the perfect addition to my event. He was funny, and entertaining! The Magic was amazing! We hired Mitch to do our client appreciation Holiday party. We cater toward seniors and they absolutely LOVED him! He was such a great addition to our event and we will definitely be using him again in the future. Mitchell is very punctual, he arrived nice and early about 2 hours before his show, to set up. He took his time, interacted with the kids, he is funny and a very good magician. Even the adults were impressed. Highly recommend, and will be using him again next year, For our Annual Christmas Party for the underprivileged kids. Thank you again, Mitchell. Great entertainer for any event! If you are thinking about hiring a magician for your event, do not hesitate to hire Mitchell. Not only will he be funny, good and everybody will love him, but he will be the most professional entertainer you'll ever hire. He arrives early, has everything ready, will coordinate and work with you on every detail, and will always be polite and super respectful to you and all your guests. He is truly a delight to work with and your crowd will be happy to see his show. He is super funny and great with his tricks. My coworkers have been congratulating me on a “good call” for having him perform at the party. He was a hit! I would highly recommend him and hire him again in the future. Mitch is a wonderful performer. He engaged the crowd and the children! Thank you for supporting Nosh Fest and doing a wonderful job! MITCH IS THE GUY TO HIRE!!! If your looking for some fun entertainment, Mitch is the guy to hire. From the first time we spoke I knew that he was witty, and he communicated very professionally. He arrived on time and started his show on time. The chatter after my son's birthday party was that "THE MAGICIAN" was great!! It was a fun hour of comedy and magic. He had ALL the attention of 50 people, adults and kids. I would highly recommend him!!! Interactive Magic Show, Funny, our Students really enjoyed and spoke about it all day. Highly Recommend it. So I took a shot hiring someone I didn't know, from a website I had never been on before. Mitch had a lot of reviews so that instantly attached me to him. After we spoke on the phone for the better part of 10 minutes he convinced me that he was the read deal when it came to magicians. Let em tell you how awesome this guy is. He was so entertaining and charismatic, I knew instantly that I hired a true professional. We had an age group from 2 to 14 year old kids that were thoroughly in amazement the entire show, and the adults could not stop laughing the entire time Mitch was on. He was such a well rounded entertainer and engaged all the children at the party. I would hire Mitch in a heart beat again, he is at the top of his game. This was a great choice for our party, and he would be for yours also. Thank you for being so good at what you do and making my sons birthday party his best yet. I know we will be seeing you soon. Mitchell was a big part of making our party a success. Mitchell did strolling magic at my husband's 50th birthday house party. He was very engaging with all of the guests. The guests found him very entertaining and his magic left them all amazed! We have hired Mitchell prior and would definitely hire him again. mitch was incredible for my sons 6th birthday party, very funny age appropriate magic and comedy, I would highly recommend for any age and audience. Mitch Davie hits on all cylinders. He's funny, charming, and most importantly an awesome magician! He always kept the audience entertained and captured the imagination of kids and adults alike. We had a great event and Mitch was the icing on the cake! Mitchell Davie was AMAZING at our Trade Show! Mitchell went above and beyond what I expected at our tradeshow. He took the time to learn about our company and incorporated the information into his tricks--it was awesome. He brought a TON of traffic to our booth and everyone absolutely loved him! We got nothing but positive feedback from our guests and our internal employees. To top it off, you couldn't ask for a nicer guy. If you are looking for a magician--he's your guy. Thanks again, Mitchell! Mitchell Davie attracted a crowd at our trade show! We could not be happier with Mitchell Davie for how he performed at our booth at a recent trade show. 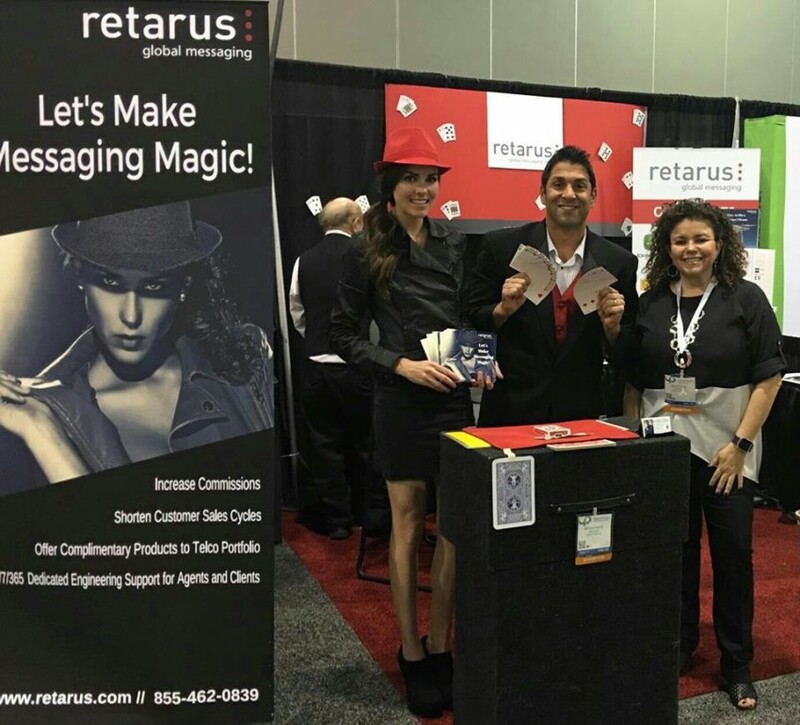 He really embraced our "Future's So Bright" theme and went out and rented a tux that matched, got the music and played it at our booth and even incorporated our marketing message while doing his magic tricks. Our booth had a steady amount of traffic because of the excitement that Mitch created. I would recommend working with him to achieve your business and entertainment goals. We hired Mitchell for our Christmas party of 200 plus adult guests to perform strolling walk around magic. All I kept hearing from my guests was "this guy is the best magician ever", and "this guy will blow your mind with his magic". He even made the extra effort to do something special for my 4 year old son. He was a big hit with the crowd. There were people that actually called me to get his number for future engagements. I would definitely hire him again! Dont which was better? The Magic or The Laughs! Mitch was absolutely the best. He was just perfect and everybody was entertained. I wasnt sure how it was going to work out as we did not have a traditional Bar Mitzva; but everybody raved Mitch. He wasnt the cheapest, but wasnt the most expensive...but he was worth every dollar! 10 of my 6 year old son's friends spent the night during spring break and we hires Mitchell to put on a show for them. He had them laughing and amazed the whole! I would definitely recommend him for your next party! Great Show, the kids were mesmerized, he truly capture their attention, even thought was a long show and kids tend to get bored. He was punctual and very professional. My daughter enjoyed the show, and got good reviews from parents at the party. We hired Mitch for our company's Xmas party and he was a huge success. He involved the whole crowd and he even involved the children. His magic tricks were awesome and we loved the fact that he made us all laugh. His personality was also a plus!!! I would highly recommend him for any event. For the second year in a row my 9 year old daughter has requested that Mitch put on a magic show for her birthday. He puts on an excellent show that is entertaining to both the children and the adults at the party. It was the highlight of the birthday party. I would highly recommend him to family and friends! What a performance! Having no idea what to expect, you caught our eyes and held our attention through your entire performance! You were cool, friendly, and magically attentive to every child. Your magic and comedy made everyone feel together in appreciation. From the children ecstatic about your real bunny rabbit to the unlocking of laughter with in each adult, Mitch, you truly have a gift you are sharing. Thank you for making our daughters' birthday party a fantastic delight!! We will see you on the big stage soon. It awaits you!!! What can we say but AMAZING! Mitchells's presentation was great for kids AND parents! We love how he incorporated all age groups into the magic show. We loved his show and everyone commented how fascinated they were with the tricks. We wish you continued success and thank you for making our son's birthday so special! Great performer and very well polished. Mitch did a magic show for our daughters 5th birthday party and he was a huge hit! The kids loved him and he kept their attention the whole time...which isn't very easy with small children. He puts on an amazing show and we will definitely book him again for more parties! Mitch performed at our holiday party this past Friday and everyone thoroughly enjoyed his show. Our CEO, Jeff Staley said Mitch's show was the best part of our entire party and I have to agree. He really got the crowd to laugh and have fun and he was very entertaining. We plan on using Mitch again next year!! I highly recommend him! The magic show was wonderful! Great magic show!! My son's 6th birthday magic party was a complete success! The kids were completely entertained and absolutely loved the show. Mitchell davie was a total professional and really know how to work with kids! We were very pleased with the show and would definitely use him and reccomend him. Highlight of our family celebration! All the the kids and adults had a great time. Mitch really keeps everyone involved and there is not a dull moment. We are still trying to figure out how he did some of his tricks and it was a 5year olds party. He is very funny and entertaining!!! We very highly recommend him and his bunny!! Mitchell was AWESOME he had everyone laughing and amazed!!!! I would recommed Mitchell over and over. We had such a great experience! We had Mitchell for our son's 5th Birthday. He went to his school and we surprised him and his classmates. We all had a great time. The children loved him as well as the adults. The comments from the four teaches in his class were that he was the best Magician they have ever saw. It was truly an enjoyable birthday for our son and well as everyone else. Thanks so much for making our sons birthday so special. Mitchell did a magic show for my sons' 1st Birthday and it was FANTASTIC! He definitely gets 5 stars on all! He had all the kids (30+ kids) all entertained and focused on the show the entire time plus all the adults as well! IT WAS GREAT! Thank you Mitchell! Mitch was great! He came out to our annual Volunteer Appreciation Picnic for the Leukemia & Lymphoma Society and did not disappoint! He was funny, interactive and everyone of all ages enjoyed his performance. We will definitely use him again as well as refer him to others. Mitch did a wonderful job entertaining the children and was able to keep the attention of 30 5-6 year old kids for 45 minutes. Although my pre-teen son and his friends challenged him, Mitch came through with flying colors. I highly recommend him for children parties and look forward to one day seeing his adult show. Mr. Davie did an amazing job at our annual Blue & Gold banquet!!! He was adept at entertaining not only the boys, but the parents and grandparents as well. He's particularly good with the youngest (6yrs.) but had appeal to all age groups. I thoroughly recommend this talented performer for any occasion!!! A totally awesome family-friendly show! I had the pleasure of working with Mitchell as our Rotary Club booked his show for a benefit fund-raiser. All of our customers walked away totally satisfied. I would not hesitate to recommend Mitch for entertaining any group. You'll be glad you did! Excellant Magic Show. We love it. Mitch Davie is real professional. He arrived early and performed his set up and sound check an hour before the audience arrived. Onstage, he performed marvelously. His act was well suited to the needs and sensibility of the crowd. He had everyone laughing with his improv-style humor and had them in awe with his magic. I highly recommend Mitchell J. Davie to any audience in any type of venue. I am a licensed talent agent and a fellow performer. Last year we hired Mitchell for our child's Bar Mitzvah to do strolling/close up magic. He was absolutely amazing. Not only was the magic fantastic but his personality was delightful, he entertained all ages being the children as well as the adults. I would HIGHLY recomend him for your event!!! We saw Mitch when he was performing at the Jungle Cruise Show. The show was funny and lively and had great audience participation. AWARD WINNING comedy magician Mitchell J. Davie has performed OVER 12,000 career shows. His seasoned show is one of a kind filled with non-stop laughter! Not only will his show have you rolling in the isles but it contains never-ending audience participation where your guests are picked to assist him for many hilarious routines. Mitchell has been seen live by more than two million people and has performed for the biggest named Hollywood celebrities and professional sports teams with both stage shows and strolling magic. In addition, he's had acting rolls in soap operas and been in short films and motion pictures. So no matter what your event; you can be sure that his experience he will deliver a most unforgettable show sure to be remembered for years to come. Also, if your company is having a trade show and you would like to maximize your investment getting a nice ROI then look no further. Generating booth traffic, getting you qualified leads and creating your company's awareness is what Mitchell does. Mitchell will highlight your products/services and stop traffic as he delivers your specific company message in a fun and entertaining way. 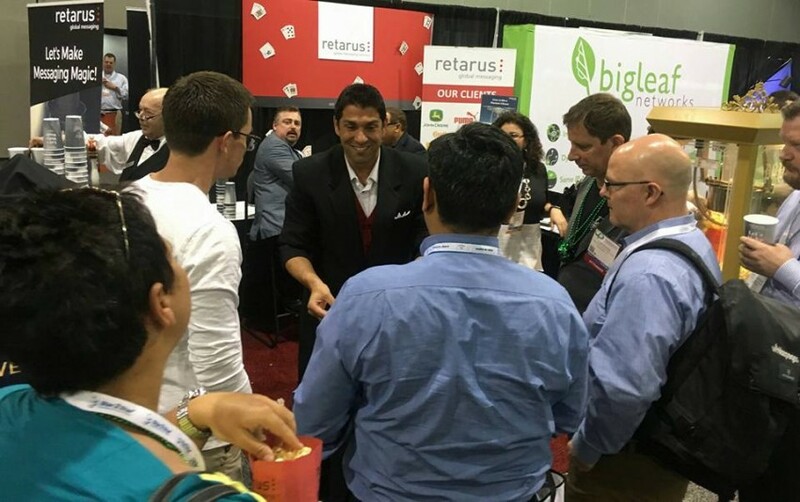 Watch the attendees flood your trade show booth unlike ever before!